Tommy Woodry (Bobby Driscoll) is a trouble-making tween with a reputation for lying. His latest prank involves his whole family: when Tommy says they’re moving from Manhattan to a Texas ranch, the landlords begin showing their apartment, expecting them to move out any day. The Woodrys are fed up with Tommy’s behavior. He frequently tells them tall tales, some of which amuse them, but his lies have started to become more destructive than funny. On a hot night after the Westward debacle, Tommy decides to sleep on the fire escape, where he hopes he’ll be able to catch a breeze. Things go awry when he witnesses a murder… and no one believes him, thanks to his reputation as a liar. 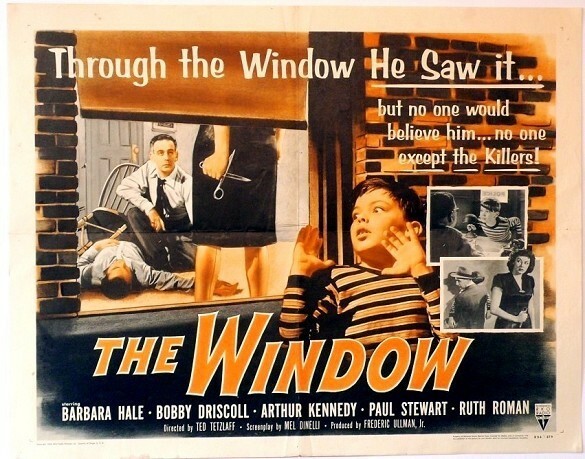 Ted Tetzlaff directs 1949’s The Window, based on a story by prolific mystery storyteller Cornell Woolrich. Starring alongside Bobby Driscoll are Barbara Hale, Arthur Kennedy, Ruth Roman and Paul Stewart. This film aired as a part of TCM’s fantastic “Summer of Darkness” programming. Host Eddie Muller noted in his introduction that children didn’t often play large roles in noir films, making The Window somewhat unique for the genre (though other examples do exist). The film combines the classic “boy who cried wolf” tale with a touch of the popular “hot weather = increased crime” theory, as seen in Alfred Hitchcock Presents… Shopping for Death (Season 1/Episode 18, 1956) and other sinister tales. This adds up to one heck of a great watch! The photography of The Window is fantastic — beautifully lit, beautifully composed. One of the most striking scenes, visually, involves Mrs. Kellerson shining a flashlight into the Woodry home through the window. Tommy creeps along the wall, narrowly escaping the flashlight’s beam. The performances match the greatness of the film’s photography, particularly those of Ruth Roman and Bobby Driscoll. Child actors are usually very hit-or-miss for me; there are a few I’d consider myself a fan of, but their performances can be very hammy, especially when pigeonholed into cutesy roles in family-oriented films. Driscoll is given the chance to show some range here, in a film full of drama and suspense. Roman, for her part, is somewhat sinister as Mrs. Kellerson, but she isn’t completely devoid of a heart. She pulls off both sides of the character with seeming ease. A sense of dread is very successfully built as Tommy tries (and tries, and tries again) to get anyone who will listen to believe his story. He’s largely unsuccessful, leaving the viewer to wonder just what the consequences will be. Things aren’t looking good for Tommy as the police ignore his claims, and his parents think he’s simply having nightmares. The film is, at times, very unsettling. 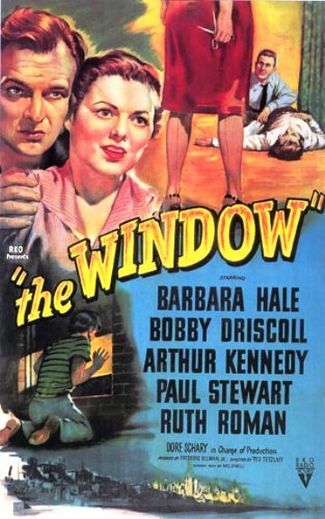 The Window is a dark and gripping noir, well worth the time of any fan of the genre, or any classic film fan in general. Not a minute is wasted as Tommy Woodry learns the hard way that he shouldn’t “cry wolf.” The score: 5/5! I’ve got this one waiting for me in the DVR. Looking forward to watching! Awesome! Hope you enjoy it! Definitely going to add this to my to-see list. Might make a nice double bill with The Bad Seed for contrast! Such a great noir. I saw this first as a kid and while laughing a lot at poor Tommy’s mostly self-made predicaments, I think it actually scared the heck out of me (although I certainly wasn’t anything like the little wolf-crying Dennis the Menace turned detective Driscoll plays!). So much for a life of juvenile to adult delinquency – thanks (again), Hollywood! This totally would have scared me if I’d watched it as a child! We moved a lot and had some pretty kooky neighbors at times. I would definitely have assumed them all to be murderers had I watched this earlier, haha. Great stuff, I really enjoyed this film and did a brief write up a while ago http://wp.me/p3sWVR-1c. The young lead played it to perfection. I was very sad to read his tragic bio, he should’ve been a big star. I’ll be sure to check out your post! His performance here is top-notch, and the story of his real-life struggles/death just breaks my heart.